We saw the Pyramids and clicked snaps with the Sphinx. But that’s definitely not all that we did in Tutankhamun’s Egypt. The last time you were there, did you order a plate of Bamya with your red wine while sitting at a piano bar in Giza overlooking the pyramids? Or gambled away a few thousand Egyptian pounds at Casino Semiramis, the night before you took off for the Island of Philae? No? Then it’s time to pay another visit to the land of the Nile. As long as you can bear the stifling heat with your hats, scarves and flowing white shirts, Egypt is waiting to be discovered—by day and by night. You wouldn’t consider missing the Pyramids or the Sphinx. So, let’s not bother with that. 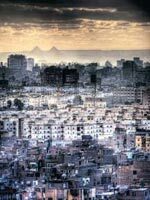 There is a lot more to Cairo, where the bustling nightlife can make Mumbai look positively conservative. The Mummy Returns: Neither Khufu’s nor Cheops’ pyramids are the oldest structures in and around Cairo. For that, we went on a short drive through picturesque palm and date tree-lined roads to Saqqara, the site of the Step Pyramid of Zoser. The exterior is a bit damaged because of years of neglect (it lay buried for many centuries and sands have eroded part of the structure) but the artwork in the underground tombs are more impressive than the Cheops Pyramid. Just a note of caution: Reach early as the place closes at 4 p.m. We reached early, well before noon and, therefore, could walk around the site before the sun blazed in all its glory. Guides, of course, will remind you that Zoser and his legend inspired Hollywood hits The Mummy and The Mummy Returns. Open: 8 a.m. to 4 p.m. Entry: 50 Egyptian pounds (Rs 400) for the Saqqara complex. scroll. Never buy from just any roadside store, though. Unless you love getting cheated, ask your guide to take you to a government-approved workshop where you will be taken through the entire method of how papyrus is prepared before being asked to choose a size, shape, design and quality that suits your budget. Buy at least one to take home (we bought, well err, more than one and blamed the credit card for it) and frame it in a dual glass frame (that’s the only way a papyrus will survive the test of time. Any wood or steel will cause air and water to seep in and destroy it). though. The perfume shops are particularly memorable. Suffused with spice and floral scents, and decorated with plush oriental carpets and beautiful crystal chandeliers, they’re run by clerks who can mix any fragrance you desire. Where: Next to Al Azhar Street. Every driver in Cairo knows where it is. Look up:www.virtualkhan.com, not to buy on the web, but to check the range of products you can shop for, once you walk into the market. building on Tahrir Square is packed with antiquities—mummies, including those of pharaohs Ramses II and III, the contents of the tomb of Tutankhamun and many other treasures. Honestly, unless you work in Fort Knox, the amount of gold will make you gasp. King Tut’s three-layered coffin—all made of gold—is an indication of how rich the Egyptians were back then. The night is young: Since it’s so hot during the day, Egyptians love coming out of their homes and meeting friends at night. Don’t be surprised, therefore, to see hundreds of locals chatting away over cups of tea as they sit on the roadside, outside a mall or crowd the many discos, pubs and jazz bars. Visit the Casino Semiramis at the Semiramis Intercontinental Hotel or the Crazy House Exit to get an eyeful of exotic dancers and live salsa performances while you try your luck at blackjack. We don’t have to tell you to take a Nile Cruise. We don’t know of many people who haven’t actually. But while you will surely enjoy the luxury liners with their spacious rooms, plunge pools, 18-course meals and belly dancers—step off them every morning to catch a glimpse of the lesser-known Egypt. Kom ombo: While Luxor overawed us and the Colossi of Memnon got the cameras out as well, the temple at Kom Ombo stood out. This unusual double temple built during the Ptolemaic dynasty is dedicated to two Gods—the crocodile god Sobek Re, god of fertility and creator of the world, and the falcon god Haroeris. Much of the temple has been destroyed by the Nile, earthquakes and later builders who used the stones for other projects. But what remains will take your breath away—like some drawings, which show that the ancient Egyptians knew the use of the stethoscope and used forceps during child birth. And at one end of the temple in a small room there are mummified crocodiles. Eeww? Well crocodiles, like many other animals, were considered sacred by the ancient Egyptians and so, hundreds of them were mummified and buried in the temple. Open: Daily 7 a.m.-5 p.m.
Island Of Philae: The final day of any cruise is usually reserved for the best and our luxury Nile cruise followed the norm. Early in the morning, we woke up to see this magical island, almost rising out of the clear blue waters of the Nile. You will have to take a felucca (sail boast) to reach the nearly submerged Island of Philae. The temples here were begun by Ptolemy II and completed by the Roman emperors and were nearly lost under water when the high Aswan dam was built in the 1960s. Fortunately, it was rescued by a joint operation between the Egyptian government and UNESCO. Take our tip and visit this amazing piece of architecture before nature takes its toll. resistance when you return to Cairo to catch your flight home? Keep an evening free and buy tickets to the Son et Lumiere show at Giza. We can guarantee the goose bumps when the silence is broken by a deep voice as the lights fall on the Sphinx to reveal how the pyramids and its protector were built, many millennia ago. Trust me, I have seen quite a few sound and light shows around the world, but nothing comes even close to this.